For this pepper and egg sandwich, eggs are scrambled along with sweet bell peppers and onions and stuffed into a loaf of Italian bread. An Italian-American staple that’s perfect for breakfast, lunch, and dinner. 1. Cut the bell peppers in half, remove the seeds and stems, and then slice the peppers into 1/2-inch-wide strips and then cut the strips in half so they’re about 1 1/2 inches long. Cut the onion into chunks or strips the same size as the peppers. 2. In a large bowl, beat the eggs with a whisk and season with half the salt and half the black pepper. 3. In a large skillet over medium-high heat, heat the oil until it starts to dance. Add the peppers and onion along with the remaining salt and black pepper. If you don’t care for your vegetables to be blackened at the edges, turn the heat down to medium or medium-low. Cook until the veggies are your desired tenderness, 5 to 10 minutes. Your entire house will smell like peppers and onions—and that’s a darn good thing. 4. Turn the heat down to medium if you haven’t already. If you want a richer pepper and egg sandwich, add 2 tablespoons butter to the skillet and let it melt. Add the beaten eggs and cook, stirring almost continuously with a fork or spatula, until they’re sorta fluffy and scrambled but still a little soft, 2 to 4 minutes. (Because the eggs are scrambled with vegetables, they’re not going to be as fluffy as they may be if you made them in a skillet by themselves. That’s okay. It’s not about looks. Just wait’ll you taste it.) Remove from the heat and, if desired, sprinkle with cheese. 5. Cut the loaf of bread in half lengthwise and open it. Cut the loaf crosswise into three 5- to 6-inch portions. Using your fingertips, scoop out some of the bread from the crust to make space for the peppers and eggs and reserve the bread for bread crumbs another day. If desired, slather the cut sides of the bread with the remaining 2 tablespoons butter. Pile the eggs and peppers on the bread. Serve the sandwiches immediately and feel free to plonk a bottle of hot sauce on the table alongside. Depending on where you grew up, your mom may have used Cubanelle peppers (aka the Italian frying pepper) in place of bell peppers. There’s a difference in flavor but it’s subtle enough that we suspect no one will complain if you can’t get your hands on Cubanelles and use bell peppers instead. Growing up in an Italian family, I know this pepper and egg sandwich as a staple meal in our house. This recipe was like a trip back in time for me. It was often served for lunch or dinner. As written, the recipe is on the money, and I followed it to a T. All the cooking times were accurate, and it was all done in just 30 minutes. It's perfect. I had this for dinner and served it on a freshly baked baguette. It made 3 sandwiches, each about 6 inches or so. I topped it off with some Sriracha and I was in heaven. This recipe is a little taste of Italy and one that I will be sure to make again. Psst. Let me tell you a secret. In an Italian-American home, peppers and eggs are not just for breakfast. All of the good salumerias around Brooklyn, NY, have this delicious sandwich on the menu for lunch. 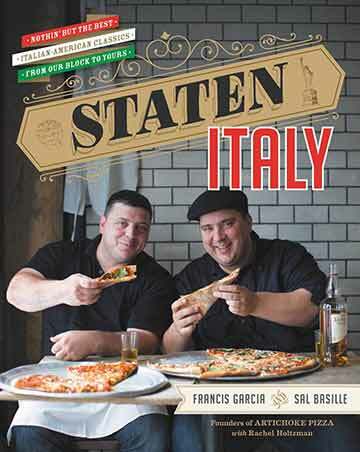 The recipe is simple and yields an authentic Italian-American hero. There's a very distinct and alluring fragrance that permeates the house when mom is making this classic. I started with a seeded semolina loaf of Italian bread cut into 5-inch portions, making 3 sandwiches. I cut the pepper and onions into a very large chop, somewhere around 1/2-inch to 1-inch pieces. I got them going in a pan with a bit less than 3 tablespoons extra-virgin olive oil. The vegetables took about 10 minutes to soften and brown. I turned the heat down and added a bit of butter to the pan with the eggs. When you cook eggs with vegetables in this way, you never get the same clean, creamy curds you do when the eggs are cooked alone. Rather, the eggs become random-size curds that cling and surround the vegetables. There is also a bit of water in the vegetables, so don't expect fluffy eggs, as they aren't supposed to be fluffy. Peppers and eggs look like an egg hash when they're done, if you can imagine that. Truth be told, I like to save some calories for a generous pour of wine at night, so I didn't butter my Italian bread before piling the eggs onto the scooped-out hero. Feel free to do so, or follow my lead and add a little mellow hot sauce. Serves 3 very generously. This easy pepper and egg sandwich is a very inexpensive, hearty, any-time-of-the-day meal. In fact, my taster and I enjoyed it for dinner. The 7 eggs make it substantial enough that you’ll forget that you’re eating a meatless hero. Since the eggs are simply flavored with salt and black pepper, the wonderful aroma and flavor of the sautéed peppers and onions (an irresistible duo, yes?) really stand out. We didn’t add anything to the sandwich, but thought hot sauce may be a good thing to have available on the table for those who like a little heat. Be a little patient when cooking the veggies; mine (I sliced my peppers 1/2 inch wide to match the onions) took just over 10 minutes to become tender enough to “flex” a bit with the eggs. The bread I used came from a local supermarket (the long oval loaf that most grocery stores generally call “Italian bread”), and was 12 inches long and 5 inches wide. Not all the scrambled eggs fit in the bread, leaving a little left over to go with toast the next day. This sandwich can serve 4 hungry people or 2 very hungry stomachs. Quick and easy to put together. I made this pepper and egg sandwich for dinner after having just made fresh homemade pita bread. (Sorry, I cheated and didn't use a loaf of bread.) The house smelled great! The eggs, when added, were soft and fluffy in 4 minutes. We filled the still-warm pita with the egg mixture, and I served it with salsa and grated cheese for my tasters to add as they pleased. This recipe served 3 people. We all added salsa and one of us also added grated cheese. We all agreed that we loved it in the pita bread. 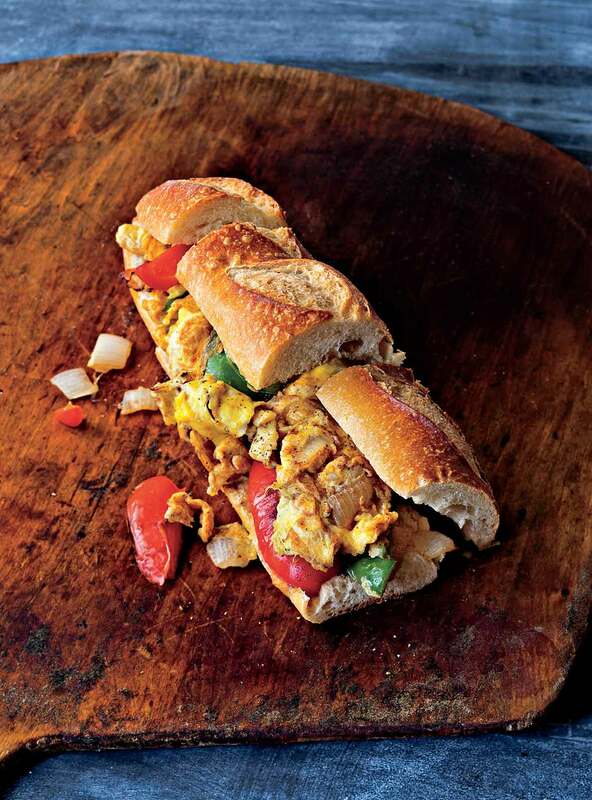 Pepper and Egg Sandwich Recipe © 2015 Francis Garcia | Sal Basille. Photo © 2015 Quentin Bacon. All rights reserved. All recipes and photos used with permission of the publisher.